Please help support this site. 2/23: Rada Wins Region Title; 3 Cougars Advance to AC! Luke Rada became the Cougars' 3rd Region Champ in program history, and their first since Tyler Fraley in 2010. Michael Jannucci defeated Middletown North's Nico Cerbo, avenging a loss from the Shore Conference Tournament, in the 182-pound final to become the Cougars' first ever 3-time District Champion. Logan Waller (120), Nicholas Moldaver (126), and Luke Rada (145), also won titles, giving the Cougars a program record 4 District Champs. Michael Jannucci is a 2-time District Champion. The Cougars have never had a 3-time District Champ. 1/3: vs. Ocean Township - With the Cougars entering B-North, this becomes an early big divisional matchup. The Cougars won the last meeting between the two, 46-21 in 2017. Another team that took a few dings to graduation, but still looks have enough pieces in place with proven returning talent and promising newcomers, to have a solid, balanced lineup. The strength of the lineup looks to be the run from 145-220. Luke Rada (26-5), a transfer from Howell, kicks the stretch off. He was a District Champ and 4th in the Region 2017, but did not participate in the postseason in 2018. He's joined by returning starters: Josephy Barsky, who is coming off a solid 16-win rookie year, Liam Hughes (5-10), Kenneth Koenig (18-16 / 2nd D21 in 2017), Michael Jannucci (22-9 / 2-time Dst Champ), Jovani Velazquez-Ruiz (16-14), and Thomas Lidondici (11-15) that gives the Cougars an extremely strong run of upperweights. The lower part of the lineup is where graduation hit the Cougars hardest. The two returning starters they do have, Logan Waller (20-6 / 2nd D21) and Nicholas Moldaver (14-16) are both coming off solid freshman seasons. They provide some stablility while some new starters are broken in that includes Jason Schulmann, Harry Weber, and Joe LaPorta, who all saw varsity action last season, as well as freshmen Michael Lyristis, Eli Novoselov, and Ford Zajac. The potential is here for a big year for the Cougars. 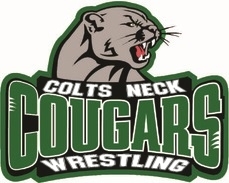 With the drop down from A-North into B-North, look for Colts Neck to be in the mix in the divisional race, and they are also quite capable of making noise in a tough CJG4 Section.